I was going through my e-mails for some information on atomic frequency standards, when I came across an e-mail that I had sent to Tom Van Baak in 2007 congratulating him for his family-friendly time dilation experiment. If you are not familiar with his work, I heartily recommend that you explore his precision-time-keeping webpage at LeapSecond.com. 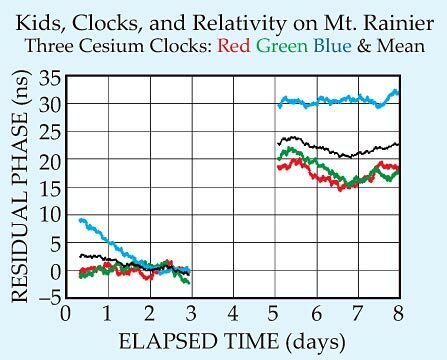 Tom wanted to demonstrate Relativity to his children, so in September 2005 he loaded the family’s minivan with portable power supplies, monitoring equipment, and three HP 5071 cesium clocks. With his three kids and some camping gear in tow, he drove the winding roads spiraling up Washington’s Mt. Rainier and checked the family into a lodge 5,319 feet above sea level. By keeping the clocks at altitude for a weekend they were able to detect and measure the effects of relativistic time dilation compared to atomic clocks they left at home. The amazing thing is that the experiment worked! The predicted and measured effect was just over 20 nanoseconds. 4.2097341558103229395399421335945 / 24 = 0.17540558982543012248083092223311 kph a little over 10th mile per hour. I do not think what you measured was Relativistic time dilation. Relative velocity is not the only way in which relativistic time dilation happens. In Tom’s experiment, a difference in gravitational potential causes time to pass at a different relative rate.